In November of 1980, Delaware State College lost a football game to Portland State University by the outrageous score of 105 to 0. The lopsided loss resulted in the Hornets being mocked by national broadcasters, pitied by their own fans, and drew the ire of Delaware State President Dr. Luna Mishoe. Mishoe ordered his athletic director Nelson Townsend to find a coach who could lead Delaware State football out of the hole they were in. Townsend found a guy he thought to be the most qualified candidate. Joe Purzycki was well known throughout the state of Delaware. He had been an all-American football player at the University of Delaware and had won a championship at one of the largest high schools in the state. He was young, charismatic, and in Townsend's eyes the perfect man for the job. There was only one problem. He was white. Delaware State is one of dozens of Historic Black Colleges and Universities (HBCUs) in America. No HBCU had ever hired a white head football coach until Townsend hired Purzycki in 1981. The news was not well received. Townsend got an idea of how controversial his decision was after the hiring was announced and a player yelled at him, "you sold us out Townsend You gave it to the white people " Questions at Purzycki's introductory press conference centered on race and why Delaware State was affording a white man this opportunity. Purzycki kept saying he only wanted to be a football coach but it was too late for that. He had become, in the words of one writer, a social experiment and he quickly found out what it was like to be a minority. "It's YOU who is going to have see everyone else's side of things," Townsend told Purzycki, "and it's not going to be easy." Students staged angry protests and the school paper derisively referred to Purzycki as "the Polish Prince." Vandals broke into his office and destroyed it, he received death threats, and the brakes on a car he borrowed from the school failed. 17 players quit the team and some people from within the school (and occasionally players from within the team) worked to undermine his effort to get the program on track. Opposing crowds, teams, and coaches were openly hostile. 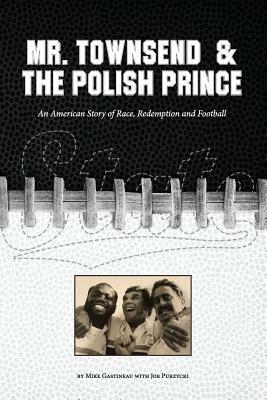 Mr. Townsend and the Polish Prince tells the inside story of how Townsend and Purzycki, often with no one else in their corner, built a relationship of trust that grew into a strong friendship and ultimately placed Delaware State on a path of football success unimaginable when they first teamed up. The duo used mutual respect, common sense, and no small amount of humor to withstand controversies big and small. In the book, Purzycki reflects on his youth, spent in an all-white neighborhood in Newark, New Jersey. He had grown up around people who didn't always have the highest opinion of African Americans and as a kid, he had come to accept their views as the way things were. It was his participation in sports, playing with and against black athletes in high school and college, that opened the door to his own eventual personal belief that we are all more alike than we think. This is a story about two men who took a huge chance together. And it is a story about the students, student-athletes, teachers, administrators, and fans at Delaware State in the early 1980s. It's a story of intolerance becoming tolerant. It's a story of something unacceptable becoming accepted. It's a story about losing that became a story about winning. It has origins at a football game on a damp night in the Pacific Northwest in November of 1980, and on a hot night in Newark, New Jersey during the riots that scarred that city in July of 1967. It's a story of how sometimes something that begins at rock bottom can end up on the mountain top.